← select your character: identifying with bible “heroes”? The reality is that the widow is never commended by Jesus. This, friends, is an assumption we have made about the text, especially in light of the fact that church giving is so esteemed amongst contemporary Christians, who often mistakenly equate the Temple and church institutions. Jesus then spends the rest of what we know as Mark 13 predicting the fall/judgement of the Temple. The story of a poor widow giving all she had to the Temple treasury is not one of exemplary behaviour, but seen in its narrative context is one of disapproval. Just as Jesus is “facing” (kateanti) the Temple in Mark 13:3 as he begins to pass judgement on it, so too is he “facing” the Temple treasury in the story of the widow. 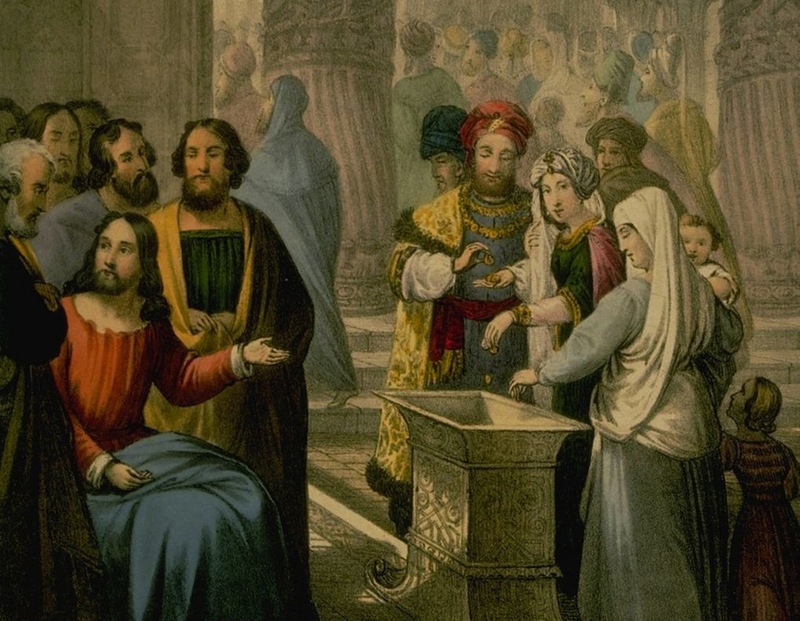 That is to say that Jesus is judging the Temple treasury. But for what? The widow gave all she had, and as quoted before, perhaps she did not eat for days afterwards. This is not something to esteem. The Temple treasury was meant to protect widows, given the numerous commands to such action in the Old Testament. But this ideal was not the case in reality – the Temple has become an institution that, rather than protecting widows, exploited them. That this poor widow gives everything she has is not a sign of her generosity so much as a sign of the dangers of her conditioning to officially sanctioned devotion. Jesus is not celebrating, he is lamenting. No doubt, modern Western preachers, teachers and scholars have overlooked Mark’s (and Jesus’) critique of the Temple system and have mistaken it for support. We have too often missed the real comment being made on the political economy of the Temple system, and the resulting judgement for religious hypocrisy and injustice. We have much to learn from this little story, both about Jesus’ expectation of protection for vulnerable people and the dangers of official religion, particularly fund-raising at the expense of people’s needs. Perhaps more poignantly we have much to learn about ourselves and the way we interpret the Bible from an imperial context, thus often twisting the original meaning of a text to suit our own ends. It is interesting that, as pointed out by Ched Myers, at the end of this story Jesus “exits” the Temple for the final time (Mark 13:1a). I am interested to hear your thoughts on what following Jesus in this case might mean. * Ian Harper, Economics for Life: An economist reflects on the meaning of life, money and what really matters, (Brunswick East: Acorn Press, 2011), 150. ** Wes Howard-Brook, “Come Out, My People!”, (Maryknoll: Orbis Books, 2010), 405. 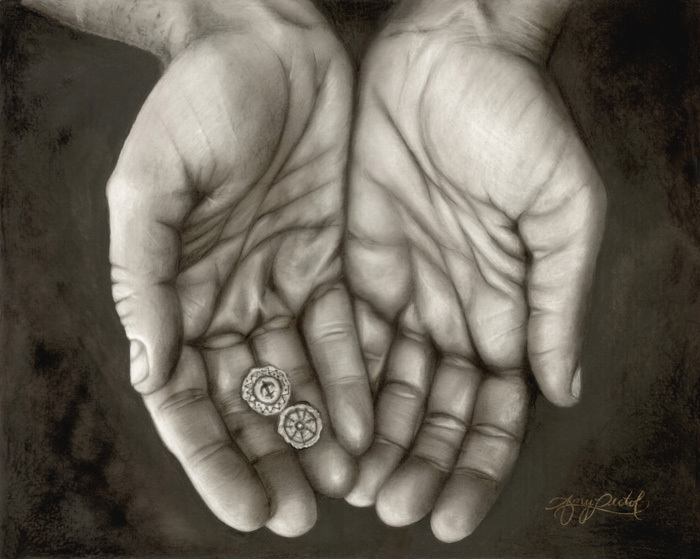 Posted on September 26, 2011, in Church/Ecclesiology, New Testament and tagged Church Giving, Exploitation, Generosity, Luke 21:1-4, Mark 12:41-44, Temple, Widow, Widow's Mite, Widow's Offering. Bookmark the permalink. 11 Comments. here, here. The key is Jesus’ description about the scribes – ‘they devour widow’s houses’. The next story is about a widow whose house (real or metaphorical) had been devoured by these people and the system they represented. Obvious really. I’ve never even considered that Jesus was doing anything else but commending the widow for giving all she had. It’s interesting how, when we hear the same interpretation all the time, we just accept it. And we fail to recognise how these familiar interpretations have been shaped by the interests and perspectives of those in power – and how detrimental they may be to other people. Thank you so much for showing me a different way to look at this story. Like always a good post. I suppose my point of question comes down to whether the church is acting in their own interests or those of the people. I find this to be the key sticking point – even amongst the congregations that have interpreted this as you have. Does Jesus walking away suggest organized mass religion will always fail to meet the needs of the poor and exploited? Where do larger churches find a balance (if indeed it’s about finding balance) so they can better serve in the long term and in also meeting the immediate needs of their community? \”All that she had\” does not mean she sold her household and everything else. She gave God what she had and wanted to as opposed to the others who were giving because they had to. There is a huge difference…it proves the fact that fortunately our God is not a financial auditor who maintains a balance sheet, but rather a loving father who cherishes in his children\’s act of faith. Now this is sounds RIGHT to me! I have given out of my need many times, and because of my faith, God gives for my need. This has happened so many times, to the point I am now able to give to ministries He puts on my heart to help support. I have to say I disagree with you. Not that I didn’t think it was an interesting perspective, but it’s not the right reading. In what spirit was the widow giving? Cheerfulness or obligation? The passage states that she only dropped in two small coins — 1/128th of a day’s wage, so maybe 1-5 dollars. And that was her tithe for a whole week. Surely if anything, any onlooker would have looked down on her for it. But Jesus lifts her up and speaks of the value of her gift in God’s eyes. God sustains the widows and the orphans. After she left the temple that day, she had no possessions. But was all hope lost? Was she alone? Couldn’t she ask for help, and wouldn’t an upright person see her and take her in and provide for her? God provides, especially when we fully trust him to provide, which is what the widow was doing. She could have bought some more bread at the market with one of those two coins. Surely she was ridiculed whether her offering was one coin or two coins. So this is not a question about the expectations of the offering box. Jesus is highlighting the widow’s faith — her trust that God will provide. And moreover, Jesus does not comment on the ills of society or the slight corruptions. When he draws his disciples in and says “look at this, truly truly I say to you…”, he is about to illuminate a gem and something beautiful and awe-inspiring. When Jesus speaks against corruption, he does not sit passively by and lament. He called the scribes snakes to their face, and he drove the money changers out of the temple with precise zeal. When Jesus speaks against wrong, he does not speak in uncertain words. If Jesus were showcasing something bad, the passage would have continued, to show what Jesus did about the injustice. But that’s not what it was. The focus of the passage was on the faith and worth of what the widow gave, and why she gave it. She knew that all life comes from God, and she was giving freely and in faith. This is what Jesus was pointing out to his disciples. Thank you for this. I am guilty of misreading this text in my own sermons and I am happy to stand corrected. This is a much more accurate reading of the text.